FARMINGTON - First let’s update everyone on the really big news. According to the Poetry Society of New Hampshire’s September newsletter, the jury is still sifting through the evidence and will shortly reach a verdict on who to recommend as state poet laureate to Governor Craig Benson - and it had better be someone capable of writing Ode to a Budget Cut or he’s gonna veto that name! On the local front, Mayor Walter Hoerman closed nominations for Rochester’s poet laureate on Sept. 13, and now all we can do is watch for a signal - a Vatican-style puff of smoke (but not tobacco smoke) - from the Council Chambers. I wish I’d nominated John Keats. He’s dead, of course, but in the Opera House section of City Hall, many of the acts that have been booked have also passed away – Houdini, Groucho Marx, Tommy Dorsey, half the Beatles, to name only a few – so Keats would fit right in. And by no coincidence, it is Keats, this week, who shares Farmington Corner’s spotlight, along with dogs. 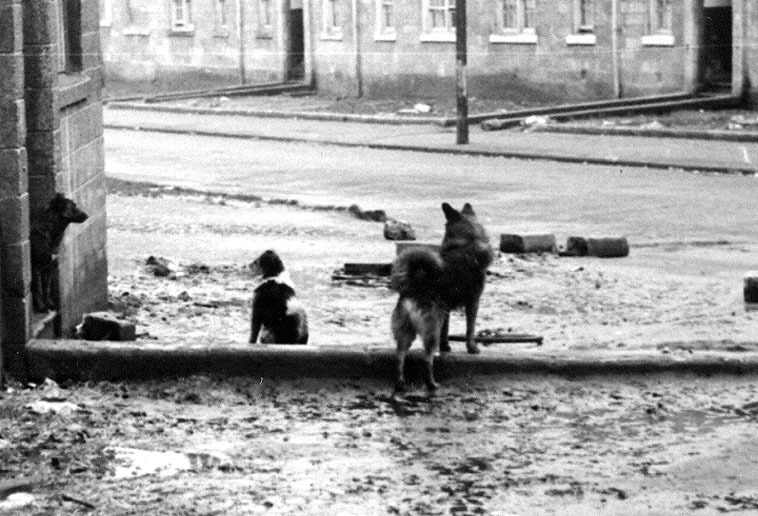 Thus, Keats would probably have hated Blackhill, the east end of Glasgow housing project, where packs of lean dogs padded incessantly through streets and back courts glistening with a million pieces of smashed glass. Plodding those same windswept streets as a policeman in the 1970s, I always welcomed the first unmistakable sign of spring. Let Keats keep his "mists and mellow fruitfulness" of autumn; the first wonderful scents of spring in Blackhill signaled that the winter rains had slackened off enough to allow urchins to set fire to the old mattresses that people had heaved out of windows, and which had somehow escaped the attentions of the municipal garbage collectors, or "midden men" as they were known. Ah! The acrid smell of smouldering horsehair! It puckered the nostrils and told the joyous brain above that winter was over. On one such delightful April evening, when the air was pungently sweet with mattress smoke, I called in on the Connollys, who lived on Queenslie Street, to catch up with the local gossip over a cup of tea. Their crack was always entertaining because Jeannie Connelly (a striking woman better known by her maiden name, Jeannie Duffy) had a sharp eye for comic situations and a turn of phrase that had its poetic roots in Ireland. She augmented her husband’s income by "going to the dollops" which meant pushing a pram over the canal into the neighboring, upmarket neighborhood of Riddrie, knocking on doors, and asking for second-hand clothing. She always dressed down for these excursions, and chose one of her smaller children to accompany her, in order to elicit greater sympathy. She would return to Blackhill with a pram-full of blouses and skirts and trousers, which she would carefully iron and then hawk down in Old Ship Bank Lane, more famously called Paddy’s Market. Jeannie took a pride in what she did, and had a contempt for those sellers, known as "pearl divers" (from leaning over into huge municipal garbage cans for their wares) who stayed in the lane only until they had achieved enough cash to buy a bottle of cheap wine, at which point they would rush away, abandoning the rest of their trash. 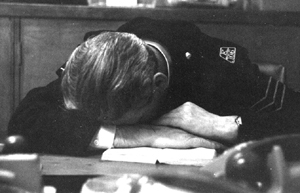 Drowsy police sergeant. Blackhill Police Station. Circa 1973. Anyway … back at the Connolly’s, I was welcomed into the livingroom, where my eye lit upon a peculiar, dark object housed inside a jam jar full of liquid. It had been given pride of place on the mantlepiece, above the fire. Her brother, Charlie Duffy, most Saturday afternoons, would head up to the Provanmill Inn, enjoy a series of pints with his cronies, and find his way back to the Connollys’ by early evening. He would then serve as babysitter for the kids, while Jeannie and her husband, John, went up to the Inn for their Saturday night out. On a recent Saturday, Charlie had come back, assumed his child-minding role, and fallen into a deep, beer-induced sleep. When he woke up, it was dark, and sensing that the children were still outside, he groggily pushed up the bedroom window to call them in from play. The window, alas, rattled down again, and with such force that it severed his left index finger. Apparently, thanks to the alcohol, Charlie felt little pain, and had the presence of mind to retrieve his finger, stick it back on his hand, wrap the mess in a handkerchief and fall once more into slumber. Some time later, the kids came in on their own and found their Uncle Charlie oozing blood through a hankie folded around his hand. Panic. An older child sped up to the Provanmill Inn for Jeannie. An ambulance was subsequently summoned, and Charlie, finger and all, were rushed to the Royal Infirmary. Little could be done. A doctor cleaned up the stump, and gave Charlie a tetanus shot and his finger back. The finger, though, fascinated his nieces and nephews, and they plopped it in a jam jar filled with vinegar, and carried it around Blackhill, as a curio for other children to see. Later, placed on the mantlepiece, the finger slowly turned black, despite the vinegar solution. "It’s time to get rid ‘o that thing," said Jeannie, giving it a glare. The living-room window, which looked over Queenslie Street back court, was open to allow the staleness of winter to escape the house and the spring-evoking smell of a smouldering mattress to seep in. One of the children obediently got up, took the jar, and was about to slosh the contents out of the window, when Jeannie, moving at the speed of light, dramatically blocked the way. "Naaaaaaaawwwww! Not oot the windae!" she screamed. "If they dogs ever get the taste of human flesh, nane o’ us will be safe. Burn it." My mind flashed at once to Keats, and Ode to a Grecian Urn. He was agonizingly torn between the immortal but lifeless scenes of beauty adorning the urn, and the fleeting vitality of real life, itself. It took him 50 lines to explore the topic, though, while Jeannie, or Super Keats, as Nietzsche might have described her, expressed, and solved, her dilemma in a shriek and a few terse syllables that graphically envisioned Man’s horrendous fate. To survive the present, the past - as symbolized by the contents of Blackhill’s Grecian Urn - must be obliterated, or mankind will be haunted by the netherworld, represented in very real terms by yon lean and hungry dogs. Thus spake Jeannie Connolly, best know as Jeannie Duffy. Wow! Poetry! Just like drink, there’s no telling where it will lead.